Recent UMass Lowell Physics graduate Kate Oram came to the Bres’ with Tom, Andy and Prof. Laycock. Kate described her amazing work at UMass, and now the engineering company “L3” where she works as an optical engineer. 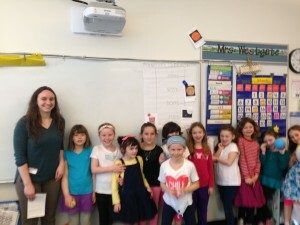 Kate designs and builds spacecraft that hunt for alien planets, scan the earth for forest fires, study the sun, and one has even flown to Pluto! 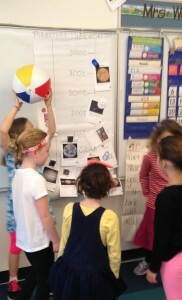 Mrs Westgate’s class made a giant thermometer and put the different planets in order from coldest to hottest. They even added in some ice cubes and soup for comparison! 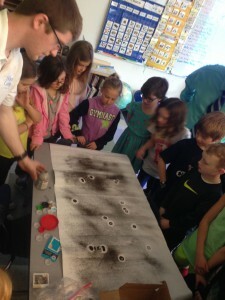 Andy and Mrs Hoiseth’s class explore the invisible patterns of magnetic fields. The magnets are hidden beneath the table, and scattering iron powder reveals them, and a whole slew of strange swirls and lines. We discussed how birds can “see” these patterns and use them to find their way on migration. 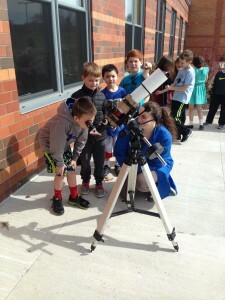 Kate helps Mrs Hoiseth’s class look at the Sun through a special telescope. They see loops of flame leaping from the Sun’s surface, and dark spots where the surface is cooler. 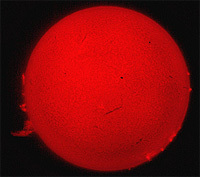 Both are patterns caused by the strong magnetic field of the Sun! Its just like the iron power patters -but waaaay hotter…….